This Life Gear Flashlight Review is written for all the folks that just need a good old fashioned flashlight to have around the house, in the car, or maybe even in your survival packs. I want to point out several of the very successful Life+Gear Flashlights in this review, because I think it is important to show you just how great these flashlights are, and just how realistic the prices are too. Life+Gear is a hands on type of company and are dedicated to that mind set at every level from developing the flashlight to promoting it to be an innovative everyday product with one thing in mind. This Life Gear Flashlight Review is going to point out just how well these things are engineered with life saving capabilities built right in the flashlights. This unique approach has resulted in a wide range of products especially in their flashlight designs. Life+Gear’s proprietary products are durable, environmentally friendly and not only can they be helpful in preventing an accident, they can assist in emergency situations. The Life Gear flashlights are also convenient and fun while traveling, hiking, camping, boating, or simply commuting in your car. By having one of the Life Gear Flashlights, you will feel more secure in protecting you and your family. Whether preparing for a road trip or responding to an emergency, the Life Gear Flashlight is reliable no matter which one you choose to take along with you. 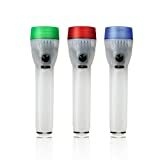 The Life Gear Glow Flashlight uses a patented technology, has 4 modes which include: LED flashlight, glow mode with LED flashlight, glow mode, and flasher mode. This Life Gear Flashlight is great to use while reading maps, signaling your friends or lighting up your path on a hike. An easy switch button located just behind the bezel gives a feeling of security while holding the handle for quick on/off. Also the handle has a small empty space where you can store keys, money, etc. Just twist to open. One really handy feature is the waterproofing of the Glow flashlight, it even turns on if dropped in water. This Life Gear flashlight only uses 3 AA batteries and they are included in the purchase It can run up to 400 hours on the flasher mode too. Bottom line: The Life Gear Glow Flashlight is a great buy for a wide variety of reasons and should be considered for your family too. Great little 6″ flashlight for the kids in your family or scouts group. Easy to take only with you everywhere. It’s reusable, water resistant, this Life Gear Mini Glow Flashlight is ready to light your way with just the press of the button on the side of the handle. This flashlight has 4 modes modes but only runs for half the time. Bottom line: The Life Gear Mini Glow Flashlight is a reasonable flashlight for most of the light duty activities. So if you are looking for a great gift for a child, handouts for the entire scouts group or just need a reliable pocket sized flashlight, this is the one to buy. This Life Gear Highland 80 lumen tactical flashlight is the smallest and least expensive of the Highland Series. Made of quality aircraft-grade aluminum, it is tough and reliable. The tailcap switch is like the high end tactical flashlights. The super bright 80 lumen LED is bright enough for the weekend warrior, avid hiker or even law enforcement. Bottom line: The Life Gear Highland Series 80 Lumen Tactical Flashlight is a good first choice for those who want the tactical style and feel without the specialised pricing. Although the flashlight only has 80 lumens, it is plenty enough light for a lot situations you may find yourself. This Life Gear Highland Series 400 Lumen Tactical Flashlight is the middle of the road in the Highland Series. As the name indicates it is 400 lumens and super bright because it uses 3 C Batteries and 3 CREE LEDs. It has 2 modes along with the famous red illuminating ring that can be used for emergency situations. Made from quality aircraft-grade aluminum so it can withstand some heavy abuse. These tactical lights come in a total of 6 different outputs: 80 lumens, 150 lumens, 200 lumens, 400 lumens, 700 lumens and the 1000 lumens. Bottom Line: For about $100 this is decent tactical flashlight. Although you can buy more technical and more expense tactical flashlights, this flashlight is the right size, price, brightness and can be used as a self-defense weapon if needed. The Life Gear Mini Max Aluminum Flashlight + Flasher is a unique style keychain flashlight. It has bright white light mode plus: red glow mode, red flasher mode, and SOS flasher mode for emergencies. It is perfect for anyone that likes keychain flashlights or wants a stashable, lightweight min light. Like other AAA flashlights It has 30 lumens of light and only uses 3 AAA batteries and made from aluminum for durability. Bottom line: A great light for your purse, glove box or a survival kit for your car. I really like the fact that is has SOS and the red flasher for emergencies. Great buy! If you think we got it right, we would like to hear from you. Or maybe you would like to leave a comment about which you think is the best flashlight then by all means please do so. If you want to review more great flashlights, click here.